Must writing a good blog be painful? 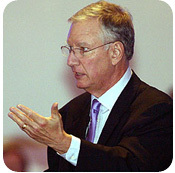 In May, Tom Peters gave his insights on what he calls "Presentation Excellence" on his website. Great, great, great stuff from a guy who knows a thing or two about speaking to a crowd. (Download the Presentation Excellence PowerPoint document from Tom's site). Authenticity. From the heart. You have to mean it. Absolutely fundamental. If it matters to you (deeply), it will matter to them. There's that word "story" again. Great presentations just don't contain great stories or anecdotes — the entire presentation is one grand story. Research. Facts. Evidence. Proof. Got to have them. But you probably only give them 2% of your knowledge in a typical presentation. But what if they want another one percent? Or what if they want an entirely different two percent from what you had prepared? Got to be ready for anything. If you know your topic inside and out — deep and wide — then there is nothing to worry about. (4) Data are imperative, but also play to Emotion. The brain has a logical left hemisphere an emotional right. We are presenting to people, who like it or not, are emotional beings. Even very technical presentations should not be data dumps alone. We must appeal to people's emotions. Absolutely crucial. And where you connect with people is on the emotional level. You have great data, but is it the right data for them? Can you feel their pain? Can you tell a story? (6) No more than ONE point per slide! NO CLUTTER!!!!!!!!! (no wee print/charts/graphs). Good quotes from the field. (Remember you’re “telling a story”). Simple visuals for the screen, always. More technical, complicated data presentation can appear in the handout. (But what about Tom's PPT slides? We'll get to that another day....). QUOTES! Use them. This is one of the great things about slideware (PPT or KEY): the ability to bring in quotes from experts and display them in 58pt Gill Sans on a 20-foot screen. Wonderful. Right. If you are just giving information, why present? Surprise, delight, challenge, engage the audience. People are busy — if they can get the same info from a book or an email, why bring them in to listen to a presentation? Make it matter. This is one important way to connect. A smile may be the single most powerful form of nonverbal communication. By "fake it" I don't think Tom means be disingenuous and paint on a phony smile. The audience knows phony anyway. I think Tom means for us to remember that the presentation is also an "act" and the act must go on, even if we do not feel like smiling. We owe it to our audience (and ourselves) to be totally engaged in the present with our audience...and smile. Again, you want to make a powerful connection? You have to look people in the eye. In large rooms (and small) look directly at individuals. Do not just cast a general gaze to the back of the room. And of course, do not look at the screen (except in glancing), look into the eyes of the people you are talking with. What's a conversation without eye contact? A presentation — big or small — is a performance, whether you like to think of it that way or not. Some think "performance" means "fake." Not at all. Have you ever seen a DVD performance of Ella Fitzgerald, Ray Charles, Frank Sinatra, or the 1968 Elvis Presley comeback special? Those cats (and chick) performed like crazy. They brought energy, enthusiasm, and had the time of their life on stage...and so did the audience. OK, we are not professional entertainers. But we must remember that our presentations are important opportunities to, in our own small way, have an impact...and change things for the better. No, it ain't easy. In fact, it's hard. But careers have been advanced or derailed based on a presentation. Deals have been won or lost depending on the outcome of a presentation. Non-profits and volunteer organizations have won funding or folded up their tents depending on their performance in a presentation. Presentations matter. And it is something very worthy of our commitment and lifelong study.